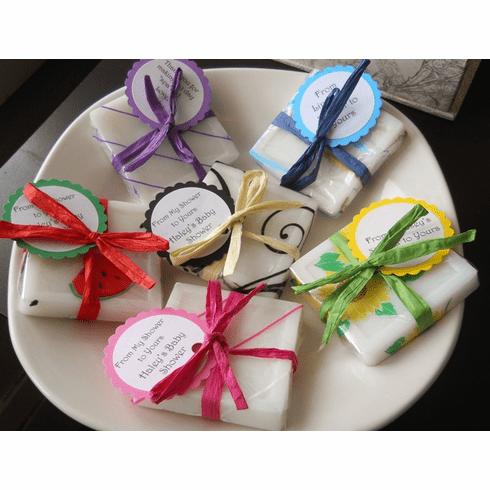 These cute soap party favors will be a great addition to your centerpiece at any party! NOTE: The purple favors are now packaged with purple flower cello. The weigh approximately 2-2.5 ounces each and our default come in the creamy soap base. If you need a different soap color, we can do that too. They are made with 100% vegetable glycerin soap that is vegan-friendly. They are wrapped in printed cellophane, colored raffia (except the black swirl wrap, this one comes in natural raffia), and a matching cardstock tag, Please let me know at check out what you want on your tag. If you chose the variety pack, you will get 4 of each of the color schemes. NOTE: All custom orders, wholesale orders, party favors, and gifts baskets are made-to-order so once your order is placed, I get to work on it. Because of this, order cancellations or returns will not be accepted on these types of orders. .